At ThrottleQuest, we just love motorcycles. What a surprise! And while it’s absolutely natural to have a bit more inclination towards some bikes, we would and do ride anything with two wheels and an engine in-between as long as it brings a smile on our faces. We have been reviewing some of the coolest and most sought after motorcycles that are available in India from established international manufacturers and our recent endeavors include Kawasaki’s ultimate ZX-14r and Harley Davidson’s custom Street Bob. Two motorcycles that bring entirely different riding experience to the rider in their own way. Saying these are just two different motorcycles is an understatement. Each has its own loyal fan base and in all likeliness the two wouldn't mix. But such a mysteriously wonderful thing motorcycles are that it would almost be a crime to dedicate our lives to just one type of a bike. So when we individually reviewed the aforementioned bikes, we were lucky enough to ride them together as well. Our stars were definitely shining bright when the keys to choose from were of the Ninja ZX-14r and the Street Bob. Tough choice it is. Really? This opportunity gave us an interesting perspective on both and this eventually led to a unique discussion amongst us – how would it feel to live with either of these bikes. In general the bikes in question can’t be compared and it would be unfair to do so, but it is only natural to understand which bike makes you feel better as a rider. The choice depends on the kind of experience you want. The dyno numbers don’t mean anything here, nor does the time on the drag strip (even though one is clearly meant for that). What matters here is the type of the rider you want to evolve into. Riding two different bikes like the ZX-14r and the Street Bob evoke such unique and strong emotions that it’s a revelation of sorts to realize the scale of these bikes. There is such a direct connection between a human heart and a motorcycle that the whole experience is so inspiring unlike anything else. We rode both motorcycles on wide open roads which is where they are meant to be, but the busyness of the city traffic can’t be avoided either. And we did put both motorcycles through this ordeal quite extensively. And let’s be honest, a motorcycle spends a great amount of time negotiating through city traffic irrespective of how much it is ridden outside of it or on the track, unless you are someone who likes to get a truck and carry the bike to the not so nearby racetrack! I, personally, would happily ride either of these motorcycles to my office daily which is in Delhi/NCR. Delhi has some of the best roads in our country and one of the interesting things about it is that while you can get stuck in the worst of traffic jams imaginable, you can also be in situations where you can give some stick to the machines and unleash some horses. We will skip the technicalities this time and concentrate only on the experience both these bikes bring. If you are into one type of a bike then you could just say NO to the other and move on. End of story. However, if you are like us and love variety of motorcycles, then you could very well spend all day and night and still not make up your mind. Kawasaki’s ZX-14r, for many people, is the world’s best hyper sports bike. A motorcycle capable of doing speeds of up to 300kph. Such speed astride a motorcycle on the road would feel nothing short of flying a supersonic jet. This is a motorcycle designed to decimate everything else on the drag strip. So is it really worth buying such a bike and commute to your office? Is it logical to spend your money on a motorcycle of which you can explore only about 30-40% of its power most of the times? Or is there more to it than meets the eye? I say there is, lots of it… the experience is unlike anything else. For this bike cannot just carry the rider, but it can carry a pillion and/or luggage as well and travel great distances fast, very fast and that too in decent comfort especially for the pillion. The single piece rider and pillion seat is wide, well padded and well suited for long rides. There are hooks too on either sides of the tail piece for attaching the luggage. Ideally, a motorcycle with a more upright riding stance is preferred for touring along with a powerful engine not to mention. But even at the height of around 5 foot 7 inches, I found the forward leaning riding position quite acceptable even in traffic. And the ZX-14r is quite a surprise when it comes to handling, in an absolute positive sense. Looking at the bulk of this motorcycle it is easy to assume that it’ll require great amount of effort to manoeuvre in traffic. But the excellent balance provided by the chassis made sure that the effort required was minimal given the overall dimensions. The extremely slow speed maneuverability, as in 10kph, particularly won me over. Never did I have to put my either foot down to aid the handling or to maintain the balance of the bike. The balance and stability even at almost zero speed is extremely impressive. Given my average height and 70kgs of weight, it’s clear that I am not a big guy and hence the overall experience of the wonderful handling characteristics left me spell bounded. Taking a U-turn on this motorcycle is equally impressive as well. Either by using a foot or without, depending on the available space, the bike never gives any nervous moments to the rider. Obviously, riding skills matter a lot in these situations as well, but then it is also easy to make out the amount of effort or the lack of it the rider is made to put in. This tells us that the center of gravity is low and that the bike is not top heavy which is a boon. Flicking from side to side in traffic requires some effort but then that is expected. However, again, the effort is never too much to ruin the unique fun in riding such a wonderful machine. Each one of us in the team was in praise of the overall handling dynamics of the ZX-14r. This motorcycle proves that a big hyper sport bike can be an extremely good handler. It is a modern motorcycle in every way. There’s also the confidence inspiring Kawasaki Traction Control system called KTRC and the ABS to make the braking as safe as possible. All the enjoyment wouldn't last so long if the heat management system wasn't equally exceptional as well. The thing about the heat is that it can’t be ignored when it’s there but if you’re not feeling it, then it’s easy to forget about it altogether. So after all the fun and enjoyment, and the immense indulgence that the 14r brings, we came to realize how effective the cooling system of this motorcycle is. Anybody who has spent a year or so in Delhi would know that the summers here can be quite unbearable. At its peak, the maximum temperature reaches anywhere between 45 to 50 degrees Celsius. It is quite terrible. Riding the big Kawasaki in the summer afternoon in Delhi wouldn't have been so easy if the cooling system was any less effective. In fact, such a good cooling system adds so much to the overall comfort while riding the bike and still almost all the credit for the same goes to the seat, suspension and the riding position most of the times. It is so easy to forget giving the due credit to the cooling system for its fantastic ability to keep the temperature of the bike and the rider under control. But even if you own it, you won’t ride it all the time or any bike for that matter. So what about when you are not riding? Well you can certainly spend some time admiring the looks of it. I wouldn’t say that it’s beautiful, but it’s stunning. The road presence is immense. Some credit goes to the trademark green color finished in sparkle metallic and majorly to the design of the headlight assembly. The sort of curvy design stacked with 4 powerful headlights can make you run your imagination. At night when all headlights are turned on, it looks nothing short of a small space ship ready to take off into the outer space. In daytime, it could even appear as if something is grinning with the mouth wide open! And when it’s approaching fast, it does look quite intimidating and I like it that way. It is my personal belief that if the look of such hyper sport motorcycles has an intimidating design element, it adds to their overall appeal. It is human psychology that a person reacts more to those oncoming vehicles whose front resembles a face. While the front of the ZX-14r doesn’t resemble a face really, the “grinning with the mouth wide open” element in the design still hits the bull’s eye. And what about the most important part, the performance? I don’t know what I can tell from what has already been said, seen, written and heard uncountable times about this motorcycle all around the world apart from sharing my own experience. Let me try and put it this way… While we all respect such motorcycles with the power so immense that it would be nearly impossible for most of us to master it, there are still unique experiences and moments that stay with us for the lifetime that cement that respect unlike any of the other qualities that the motorcycle have. The moments that remind you what you are riding. Ironically, those are also the moments that we normally tend to forget! I have one such experience to share. It is an understatement to say that the ZX-14r can still knock your socks off even when ridden in the LOW power mode, the mode in which I rode the bike. However, on few occasions when I twisted the throttle hard from the stop given the favorable conditions, the acceleration was so quick that for a moment or so my vision went blurred before my eyes adjusted to the speed. This particular experience is also the most cherished moment of my whole experience with the ZX-14r. This is my “Street Hawk” moment. On the other side of the spectrum we have the Street Bob, well, what can I say! A motorcycle from Harley Davidson is a dream for many motorcycle enthusiasts around the world; such is the love and admiration this motor company enjoys. It has some of the most faithful and loyal customers around the world. It’s like the one and only love affair for life! The fan following is huge and the impact of Harley Davidson on bikers and in the cruiser segment is hard to match. Love it or hate it, but you can’t ignore it. One of the good things about owning a Harley is the level of customization you can do on your motorcycle. The company offers great level of customization options that enhance the aesthetics as well as the performance of the vehicle. And our Street Bob was one such motorcycle customized with the out-of-factory Yellow/Gold Hard Candy Custom flake job, stage 1 air intake and matching Screaming Eagle exhausts. All these add-ons take the visual appeal several notches higher over the standard Street Bob. And the Screaming Eagle exhausts make the bike loud enough to match its personality. Twist the throttle in neutral and the distinctive note from the exhausts can be heard along side the engine sound. That distinction in the sound is good enough to make us want to ride the bike, as if the whole visual appeal wasn’t attractive enough! The Street Bob gives completely different vibes as it is so much different in character compared to the Kawasaki. Where the ZX-14r loudly says it’s an absolutely modern motorcycle and technologically superior, the Street Bob will take you closer to the roots of motorcycle design perhaps. As mentioned in its dedicated review, the Street Bob is a quintessential example of a basic cruiser styling – spoke rims, a bigger front wheel than the rear, a single rider and pillion seat and the mini ape handle bar. A flashy paint job notwithstanding, the cruiser styling is as simple as it can get. The Street Bob could actually be one of the best examples when you are describing the word “Motorcycle” to a kid. You see, it is easier to explain the concept of a motorcycle to an unadulterated brain of a child when he/she can actually see the two wheels being connected by a motor in-between, and obviously there’s a seat to sit on and a handlebar to control the vehicle. This raw, uncooked design element naturally has a direct connection with the human heart. It wouldn’t take one to be a rocket scientist to eventually understand that for this very reason, the words like macho, as in the raw appeal of being a man, are associated with cruisers in general. So while you would imagine yourself to be in a proper leather riding suit astride the ZX-14r wearing an equally technologically advanced full face Arai helmet, on the Street Bob though, you would feel more at home in a no-frills leather jacket that looks equally good on and off the bike, high heel leather boots, a denim jeans that looks like you’ve been there and done that and an open face visor-less helmet (still a DOT certified though). An Aviator sunglass would be perfect to finish things off. It is nothing short of an amazement that how the design of these two motorcycles invoke absolutely different feelings from the same rider. The experience of riding the Street Bob is a revelation in itself. This is a motorcycle that can be enjoyed in slow speeds as well. While the heat coming out of the air/oil cooled engine can be felt easily in traffic, the riding pleasure is quite unmatched. Your thoughts are away from all the technical aspects of the motorcycle when riding this Harley. While the ZX-14r is quite an all-rounder, riding it is still about experiencing the rocket-like acceleration more or less. The Street Bob though is more about how it makes you feel as a rider. And it is all related to the rawness of the whole experience of riding a plain cruiser. When you are in the meat of the torque, the Screaming Eagles produce such an ear pleasing sound that it is pure magic. Keep a consistent effort on the throttle and the exhaust note sounds like a machine gun attached at the front of the bike. With an exhaust note like that, the feeling of passing through traffic and leaving everything else behind is quite an unmatchable feeling which is hard to put in words. The whole experience on the Street Bob is so good that it will lead you into accepting certain imperfections like the not-so-good suspension. But if you are someone who is aware that the aftermarket suspension can make your ride better, then Ohlins has a pair of rear shockers for that job. The seat is also well padded and combined with the riding position the overall rider comfort is very good. Unfortunately, the Street Bob we had didn't have the pillion foot pegs for some reason so we couldn't test the pillion comfort particularly. The handling on the Street Bob is surprisingly light considering that it is 305kgs ready to ride. This was quite surprising as I found it lighter to handle than the Iron 883 which is actually a lighter bike. It seems that the Street Bob carries its weight low which feels better on the road. The light handling, combined with Screaming Eagles, actually put quite some fun in negotiating the Street Bob through traffic. The Street Bob is a relatively “modern” motorcycle in itself. Though it can’t match the ZX-14r on the safety features, the Street Bob at least comes with the ABS. And while the whole braking performance of the Harley isn’t in the same league by far as the Kawasaki’s, it is acceptable (better than the Fat Boy that we rode earlier). At the end, it was hard for us to part with the ZX-14r and the Street Bob when the time came to return them to their respective manufacturers. We had a truly wonderful time riding the two bikes; the experience is quite out of the world. These motorcycles shatter the myth that big bikes or bikes with big engines can’t be enjoyed within a city. That is just wrong, wrong if they are made right. However, there is no denying that these motorcycles are meant to travel great distances to fully enjoy their worth and explore their capabilities. You cannot go wrong with either of these motorcycles. However, you have to be clear what you want because the experience that one gives cannot be found in the other. You have to be clear about the experience you are looking for as it’s all about it and nothing else with these two absolutely different and wonderful motorcycles. Both these bikes are well beyond capable of doing long distance travel with pillion and/or luggage. And while the more demanding riding position of the ZX-14r and the engine heat in the Street Bob can lessen the fun sometimes, there’s much more to each of these motorcycles than what the mere spec sheets say. We have not picked a clear winner in this “comparison” review because this is not a typical comparison of two motorcycles. Actually, this is not a comparison at all. 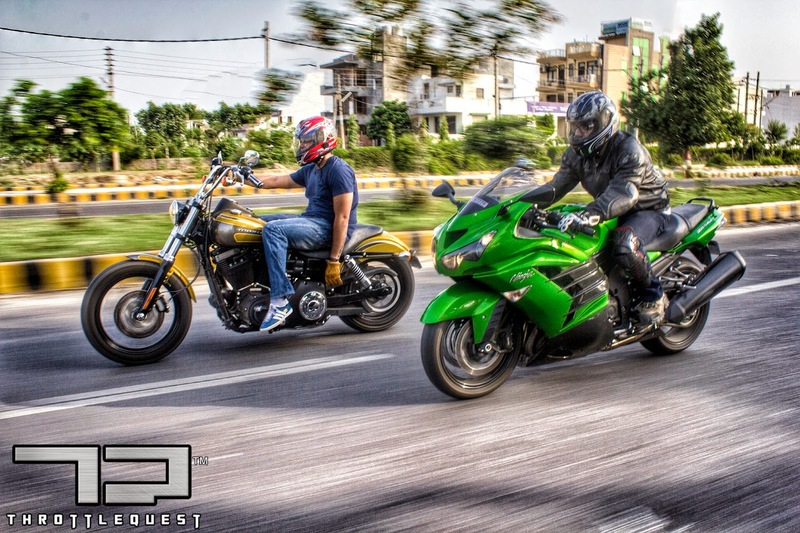 What we did here is share our experience that we got riding the ZX-14r and the Street Bob. And even when we were talking about our unique experiences and what each one of us would prefer to take home, we never really narrowed down on any one bike. We wanted to ride both motorcycles as much as possible and we want to. 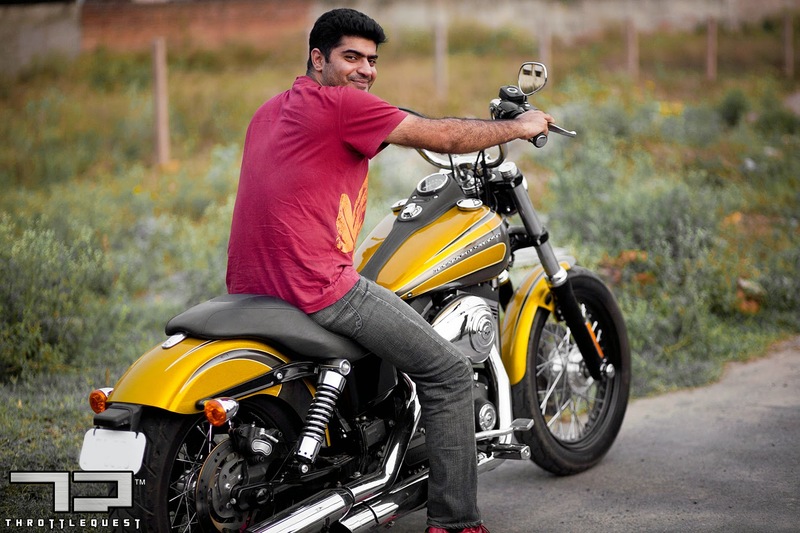 It is unbelievable how a motorcycle can bring a character out of a rider and develop it. I guess that is also how the motorcycles get their character as well. The man and machine complementing each other, it’s a unique relationship. So this message is for each biker out there including me that if you ever get a motorcycle like the Kawasaki ZX-14r and the Harley Davidson Street Bob, then get out and ride them as much as possible. Ride them not just to the nearby café or to your office, but take them outside the boundaries of the urban environment as often as you can. Explore the country on these amazing machines, it would be so unfair to not do so. From my little time on these motorcycles I can guarantee you that the experience will be larger than life, something that will be cherished for the lifetime.